The most colourful stop on my train journey down the coast was at Muizenberg, a beach-side suburb of Cape Town, South Africa. I have seen the colourful Victorian bathing houses of Muizenberg on countless of photos and couldn’t wait to see them for myself. As we arrived the train station platform was quite deserted seeing as it was a chilly day. I can just imagine how crowded it must be in summer as Muizenberg is a surfer haven. It has a fine, long beach that in effect stretches all the way round the top of False Bay to the Strand, a distance of over 20 km. Not a distance that I am going to walk any time soon. Although Muizenberg beach lacks the dazzling turquoise ocean and dramatic boulders of beaches like Clifton and Llandudno, the rocks and colourful bathing houses create a stunning contrast. The beach is flat, wide, and the water is generally calm making it the perfect beach for a lovely stroll. I was quite disappointed as we got onto the beach and saw the beach houses. But dont worry, this small row of beach houses you get as you enter the beach is not all there is to it. After having a look on the map we brought with we saw that the Victorian beach houses were actually further down the beach. A little further down the beach is the actual row of colourful Victorian bath houses! Its not that far to walk and as the beach is quite flat its an easy walk toward the colourful Victorian bathing houses. They are definitely a visual echo of a time when this was Cape Town’s premier swimming beach, and provide a good photo opportunity. I think I ended up capturing them from every angle and if you go up onto the boardwalk behind them you get great shots with the ocean in the background. There’s something ‘retro’ about Cape Town’s Muizenberg Beach, an echo of an era when seaside talent shows and parading along the promenade were all the vogue. No doubt it’s the old-style beach pavilion and those iconic, boldly-coloured Victorian bathing ‘boxes’ or huts which evoke the feeling of a step back in time. They are all locked up now and I wonder if they actually still get used as the locks look quite rusted, although this could just be because of being situated right on the beach. What a beautiful, vibrant post. Lovely photos of an amazing part of the world. Thanks. I was there yesterday. Go there as often ad I can because we stayed there when I was a child. Was at the beach almost every day as we lived two streets away. 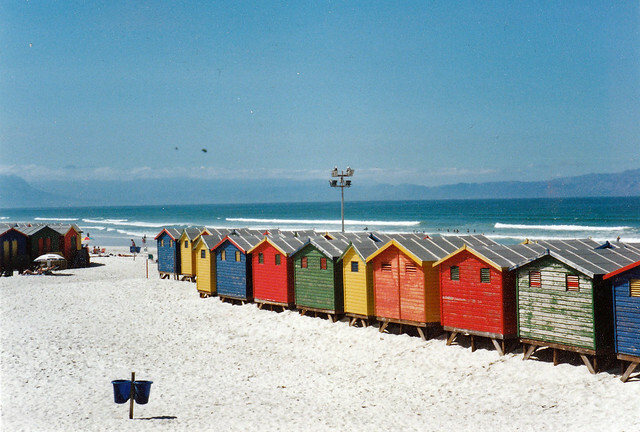 The colourful beach huts are in dire need of attention. Perhaps a group of people want to get together and paint them, fix them up a bit so they can be used again. Apparantly they are not currently in use anymore which is sad. If they are restored perhaps they can be rented out again. looks like a very beautiful spot! It is and I look forward to coming back in the summer to spend an afternoon here. Janaline, I love the bold, bright colour of the Bath Houses. We have similar ones in Australia, but they’re not painted as brightly. Thank you for sharing it! So true! Are the ones in Australia still in use? I hope so as its so sad when something this beautiful ends up just being a photo opportunity. Yes, they are in use and some have been in the family for a few generations. Wonderful colors. They look so well maintained I hope they are used for something. I havent been able to find out if they are still in use, but the locks on the huts look rusted so I dont know if they are. I agree Sue, its the perfect place to spend an afternoon. Still have to pack myself a pic-nic and go and spend a sunny afternoon there. You may find it a little windy in the afternoon! St James is usually nicer. This suburb is where I used to live Sue, you can understand now why I have missed the sea so much.